Thank you for your support and encouragement for my earlier posts on packaged foods. Some of you had suggested me to do the ingredients analysis for a few more products. 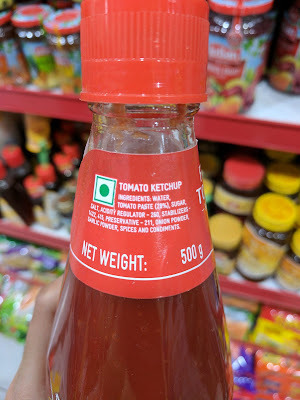 One such product is the most commonly used Ketchup. It has become a staple ingredient in many urban kitchens. Having established the product category in the past decade or so, the profit-chasing packaged food manufacturers now want consumers to consume more of ketchup. 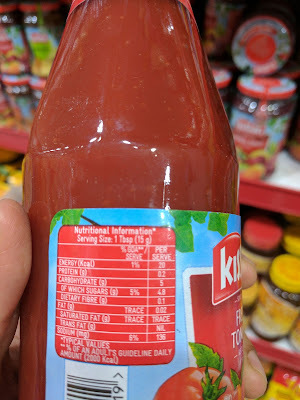 If you are buying say one bottle of Ketchup every 3 months, the brands want you to buy a bottle every month. Towards this goal, there have been rigorous promotions happening with the support of prominent chefs and food bloggers. One such initiative that made me furious is “Kissan tiffin timetable - 200 tiffin recipes for 200 school days”. For parents who are reading this, you can easily pack healthy and yummy tiffin for your kids WITHOUT any ketchup. Please don’t get caught into this mess, just because a model-turned-chef cooks pretty looking dishes that pretend to look healthy. Our kids don’t need cute-sa-pyaara-sa dishes, they need “real” food that helps them to stay healthy and strong and live a long life. To the oothappam batter, the “chef” adds some vegetables and then adds “magic ingredient which will enhance the flavour”. She generously adds 3 tbsp of the ketchup and the reason she gives - "ketchup helps to keep the oothappam nice and moist". 2 minutes into the video and I couldn’t take it any longer. 1. Whenever I open the ketchup bottle, my 5-year old gets super excited. I rarely serve ketchup along with a meal. Only on days when I make a veg fried rice or fry some bhajjis, ketchup is taken out. When we go out to eat, my daughter orders French Fries, just so that she can lick some ketchup that comes in the sachet. Clearly, there’s something addictive in it, that makes kids go gaga over it. 2. I tried making ketchup at home a few times by myself. I did use fresh, ripe and juicy tomatoes but couldn’t get that deep red colour or the thick consistency. 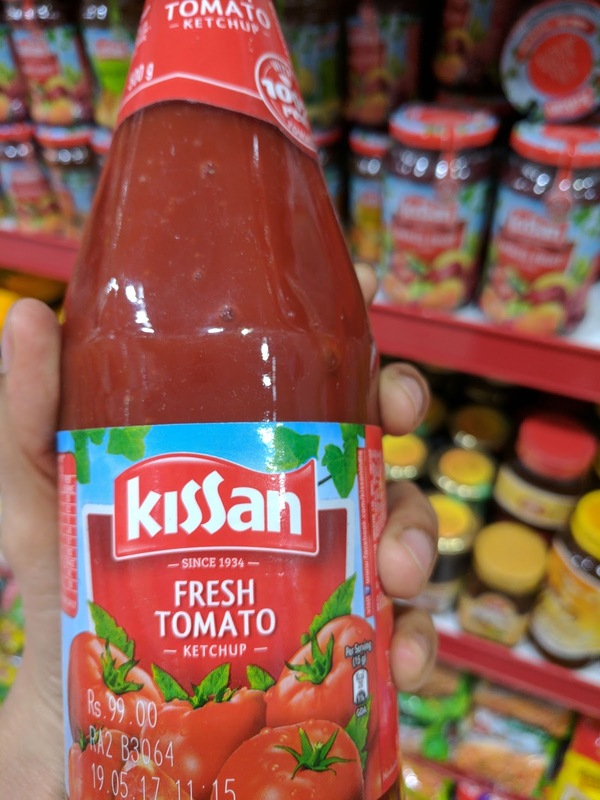 I went to the store and looked at the pack of a Kissan Ketchup bottle. There was this statement (all capital letters) that grabbed my attention - “CONTAINS PERMITTED CLASS-II PRESERVATIVE”. I was curious to know why such an emphasis was given, since we all know that most packaged foods contain preservatives. As I researched this topic, I learned that there are two classes of preservatives. - natural preservatives such as salt, sugar, edible oil, vinegar, spices and honey. - chemical preservatives such as benzoates, sorbates, nitrites and nitrates of sodium or potassium, sulfites, glutamates, glycerides and the like. 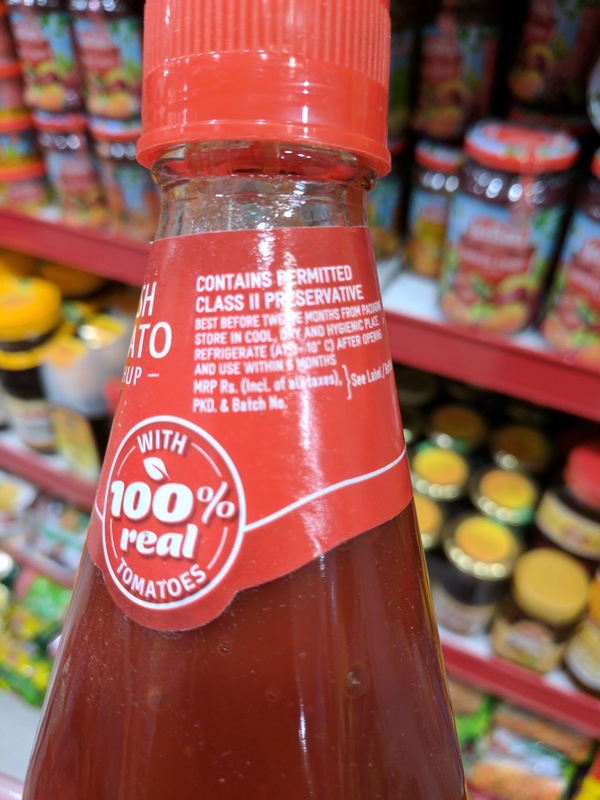 The food standards regulations require that not more than one class II preservative to be used on one particular food item. In this pack, Preservative 211 - Sodium Benzoate is being used. I panicked and rushed to my fridge to reconfirm that the ketchup brand I’m using doesn’t have such preservatives. Thankfully, none were listed. But I decided that this is the LAST ketchup bottle I’m buying, irrespective of whether it contains E211 or not. My daughter will have to learn to eat her bhajjis with coconut chutney. As per the nutrition table, 1 serving (1tbsp - 15 gms) contains 4.8 gm of sugar (little more than 1 tsp). Compared to other junk, the sugar quantity is relatively low. As per the nutrition table, 1 serving (1tbsp - 15 gms) contains 136 mg of sodium. And it says it is 6% of GDA (Adult’s Guideline Daily Amount for a 2000KCal diet). If ketchup is adult’s food, then why is the model-turned-chef making tiffin timetable for kids? As I mentioned in my earlier posts, the adequate intake (AI) of sodium for kids in the age bracket of 4-8 years is 300 - 600 mg/day. If we take the average (450 mg/day), then 1 tbsp of ketchup will be 30% of their AI. So that’s exactly the reason why kids get addicted to ketchup - TOO MUCH SALT. Wrote about this in my earlier post on ready-to-eat soups. Though not very harmful, it aggravates food intolerances and allergies. My main concern with this pack is that E211 preservative. And the excess salt. Let’s teach our kids to eat their parathas with curd, bhajjis/pakoras with chutney, dosas/oothappams with molagapodi. I’m sure all of us have a Ketchup bottle at home. Do check out its ingredients list and see if it contains any Class II preservative. Let's think of healthy, homemade alternatives to use in place of ketchup.